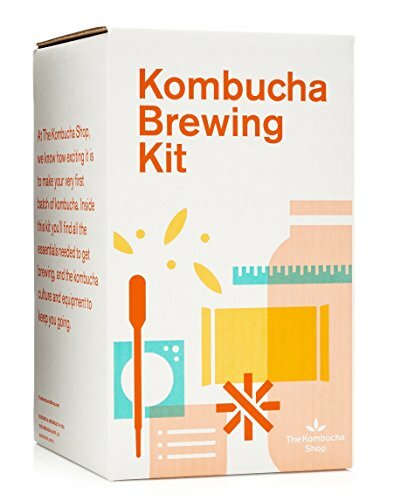 MADE BY KOMBUCHA BREWERS FOR KOMBUCHA BREWERS: This kit has helped hundreds of thousands of people just like you become rockstar kombucha home brewers! Including only 100% organic ingredients, you'll have everything you need to start brewing as soon as it arrives and the kombucha culture and equipment to keep you going for years. QUALITY PRODUCTS: We've already done the research and design for you - the included 1 Gallon Brewing Jar is made of thick American glass and built to last. Screen printed on the side of the brew jar is our unique Brew Notes feature, allowing you to keep track of the details of each brew. Our custom pH test strips and temperature gauge will help you monitor your brew's progress. Feel lost at any point? Our customer support team is here to quickly answer any of your questions along the way. EXPERT KNOWLEDGE: More educational material than any other kit on the market - we ensure your brewing success! Our fan favorite brewing instructions take all the guesswork out of brewing for the first time. When you're done with your initial brew, the included 16 page Post-Brewing Guide will walk you through how to bottle your brew, experiment with different flavors and care for your kombucha culture. CERTAIN TO GROW: Our kombucha cultures are commercially grown using only purified water, organic sugar, organic teas and organic kombucha starter. We take pride in growing the healthiest, happiest kombucha cultures possible so you can start off brewing on the right foot. THE PERFECT PRESENT: This complete and beautiful kit is sure to be the perfect present for any kombucha fan in your life! If you have any questions about this product by The Kombucha Shop, contact us by completing and submitting the form below. If you are looking for a specif part number, please include it with your message.